Visitors to this year’s Royal Highland Show were treated to some of the latest products from both Scottish manufacturers and further afield across the UK and Europe. Richard Bradley reports on some of the highlights from the 2017 event. Pictures by Marcello Garbagnoli. Based at Forfar, the latest product from Ritchie was its telehandler-mounted calving cube, which aims to make calving, moving and operating on cattle more convenient and safer for people and stock. The attachment is made up of a main frame with locking head-yoke and three, 3m gates which fold-out to make a pen to catch animals. Locking yoke section features a chequer-plate floor and side gate, so cows can be fastened in allowing the telehandler to lift the animal out of the pen or field safely. The floor extends out from under the locking section which allows calves to be safely carried, vets to work on a clean and level floor, or, with the internal-gate removed, equipment carried to the field such as gates or an atv. Gates at either end of the floored section allow convenient access around the animal. 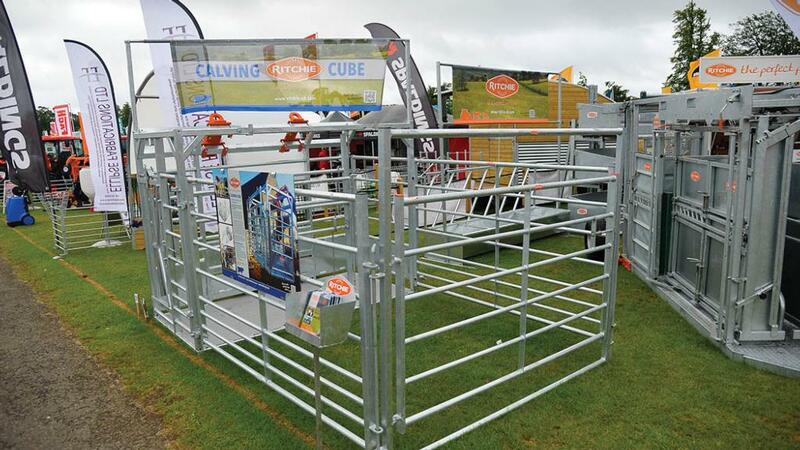 Price for the Calving Cube is £2,800 without loader brackets. 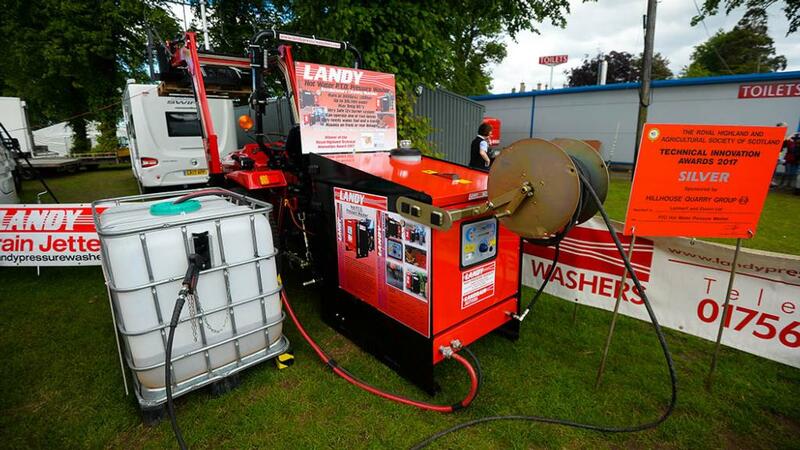 While not residing in Scotland, Yorkshire based pressure washer specialist Landy won a technical innovation award for its pto-powered hot pressure washer. The washer can be mounted to a tractor’s front or rear three-point linkage linkage and uses the same pto-driven pump as the rest of the firm’s range of washers, with the addition of an electrically-driven kerosene burner to heat water up to 90 degrees Celsius. Electrical power for the 12volt burner is taken via a connection to the tractor’s battery, and the firm says its 80-litre on board fuel tank should last for a long day’s work. Pump requires a minimum of 20hp, and the tractor needs more than 50amp alternator to prevent draining the battery. With a single lance fitted and at 540rpm from the tractor, the pump provides 16 litres per minute at the nozzle, which is enough flow and pressure to need two hands on the lance. Running the pump at 1,000rpm allows the pump to be used with two lances at similar 15l/min flow or as a drain jetter with 30l/min. A step-down gearbox can be fitted to reduce engine speed. Water supply requires a clean header-tank, such as an IBC or trough, as the pump is able to draw water in. A normal water line will also suffice. Landy says the machine should appeal to pig and poultry units, as it is far more portable than a mains-powered unit. Price starts from £4,500, depending on pipe fitment. 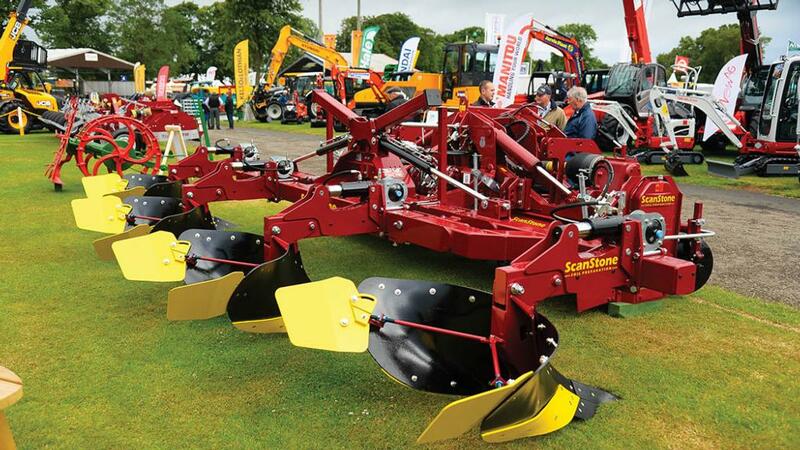 Potato equipment manufacturer Scanstone showcased a number of its latest products at the show. Alongside its heavy duty, tractor-mounted unit, the Forfar firm showed its lightweight bed former which is now available in a four-body model. The firm says the former is suitable to mount directly to a tiller, where a heavy build is not required as working speeds are low. It also allows smaller tractors to be used. The hydraulically folding machine features hydraulic auto-reset, with shear bolts allowing bodies to pivot backward in case of emergency. Mould-boards are also now available with sacrificial wear strips, to extend board life. Price for the four-body model on show with auto-reset is about £18,000. Scanstone also showcased its extra-long windrower cross-conveyor, which allows up to eight rows to be opened up in a field. The manufacturer says this allows a large harvester and trailer to get into work without crushing any potato rows. Conveyor features hydraulic side-shift to windrow to the left or right hand side, and either end features a lowering section to reduce drop height. 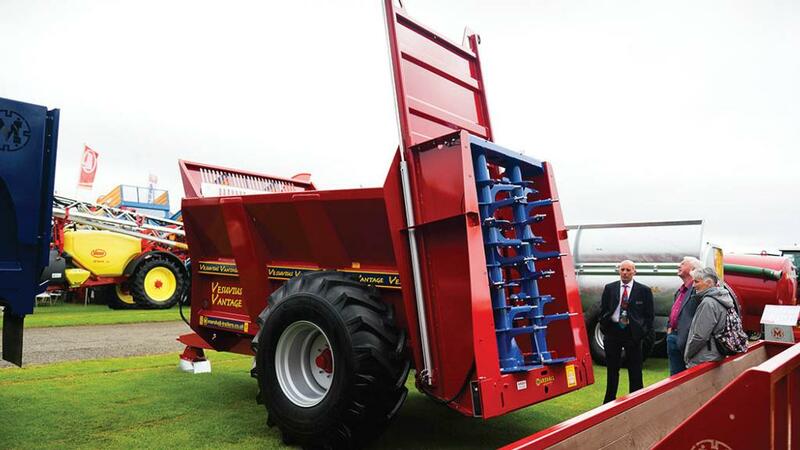 Aberdeen-based manufacturer Marshall showcased its updated Vantage rear-discharge muck spreader range at the event, which comprises three models. Marshall says capacity has gained an increase, now up to 15 tonnes, thanks to the spreader’s new side panels, which flare outwards above wheel-height – easier loading is another benefit according to the firm. Rather than using a more conventional chain and slat moving floor system, the Vantage uses a hydraulic push-off headboard, which now features nylon wear blocks to reduce wear and tear. At the rear, the firm says revised beater design ensure they are properly balanced. Preventing build-up of muck on the machine’s lights, covers are now featured which are hydraulically operated and linked into the spreader’s slurry door, with the covers lowered before the slurry door is lifted. Other updates include centralised greasing points and hydraulic hoses joined at the bulkhead, meaning if pipes need to be replaced, they are in more manageable and cost effective lengths. Retail price for the 13 tonne model on show is £22,703. 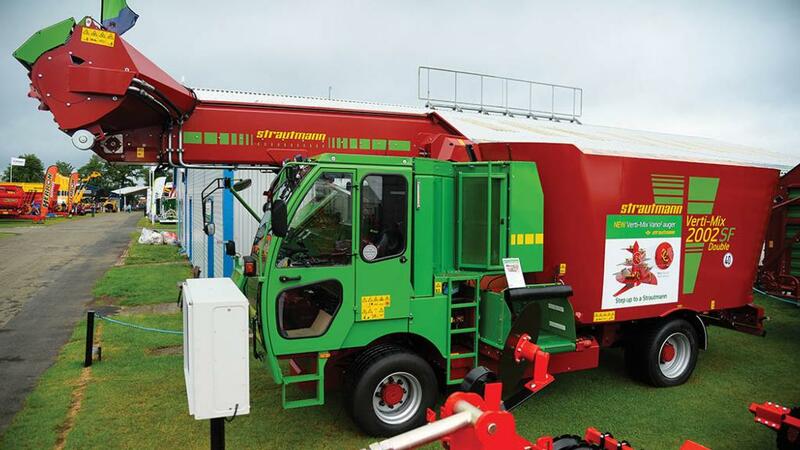 UK machinery importer Opico showed Strautmann’s self-propelled mixer wagon for the first time in the UK. See our full report from the launch. Entry level Sherpa models with 12 and 14 cubic metre capacities feature a single auger, with higher-spec Verti-Mix SF single and twin auger models available in 11-20cu.m capacities. Standard fitment on the range is a 2m-wide cutting head to remove forage from the clamp, and Strautmann’s stepped vertical mixing augers, which the firm says help to improve mixing times. The firm’s 20 cubic-metre SF model on show features a 6.8-litre John Deere engine, and optional 40kph hydrostatic transmission, air suspension, four wheel drive and steering, which reduces turning circle to 13m. This model will be used as a demonstrator across the UK. To give a guide, the firm says month costs on a five-year plan can range from £1,700-£3,500, depending on size and specification. It does not take a genius to figure out the two main features of JCB’s latest Teleskid concept. Based on its existing side-boom Robot skid steer, the Teeleskid features a telescopic boom to offer lift height to maximum 4.05m. Lift capacity at full extension is rated at 611kg. As with a conventional telehandler, parallel lifting is possible in both raise and lower, with boom suspension also a standard feature. Mounted to the headstock, one auxiliary line with return flow is fitted. Power comes from JCB’s four-cylinder Ecomax engine, which produces 74hp which does not require diesel particulate filtration. Hydraulic reversing fan is featured, as is a two-speed hydrostatic transmission with a 20kph top speed. 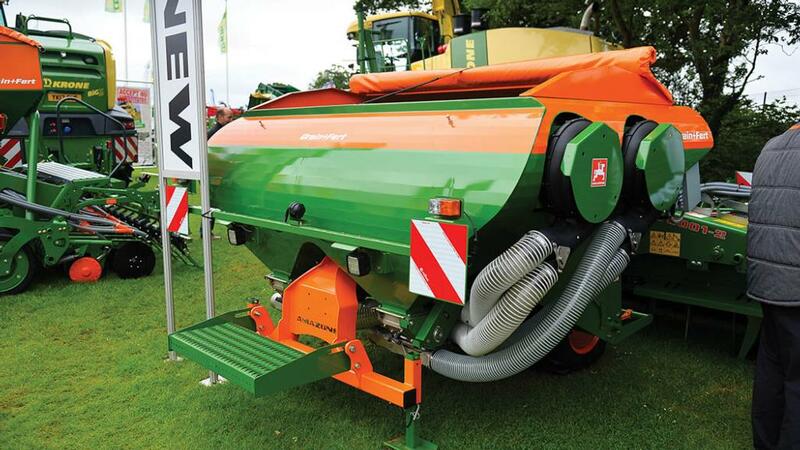 For ease of servicing, rear bonnet hinges open wide, and cab tilts forward to allow access to hydraulic systems. 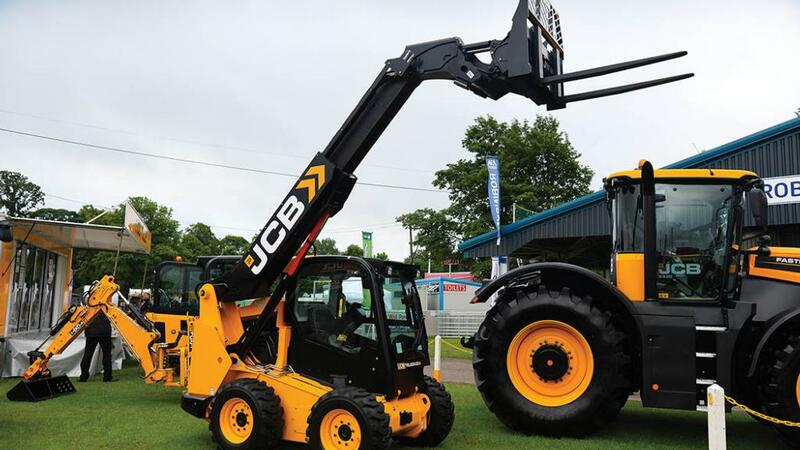 JCB says the machine is ideally suited to farmers and amenity users where access in confined spaces is required. Retail price is about £58,000. Driven by customer demand, Amazone has added seed and fert capability on its widest combination drill offering with the addition of a new split front-mounted hopper. Designed for use with its hydraulic folding combination power-harrow units, the 2,000-litre hopper features two equally split compartments. Four electrically-driven metering units send material to the drill coulters thanks to hydraulically-driven fans, which features separate distribution heads for seed/fert on each of the drill’s two sections. The firm says all four heads also feature electric shutoff for tramlines. Amazone’s tried and tested RoTec Pro coulters are fitted, with both seed and fert pipes combining at the coulter. While IsoBus control is possible, two separate controllers are required, one to control grain metering and one for fertiliser. Price is TBC as the firm is yet to begin full production of the hoppers.